These cupcakes are for Jurij Dreo, a med student working in a neurophysiology lab in Slovenia. 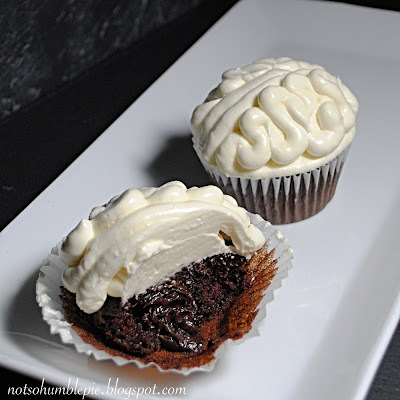 Jurij wanted to see something neuroscience or brain related on the blog and this is what I've whipped up: chocolate ganache filled brain cupcakes! Because it is a well known fact that human brains are filled with chocolate ganache. Me: I need ideas for a cupcake flavor that is brain related, or 'brain healthy.' You know, sort of like how Cheerios are considered 'heart healthy', what would be brain healthy? Mr. Humble: Fish is brain healthy, you could make salmon cupcakes. Me: Gross. I'm not making salmon flavored cupcakes. Mr. Humble: Why not, you did make a bacon cake. So I tossed out the idea of being clever by making 'brain healthy brain cupcakes' out the window. Well, I suppose cacao could be considered a 'brain food', but certainly not in this form. So I am not going to pretend these little cakes are in anyway good for you. 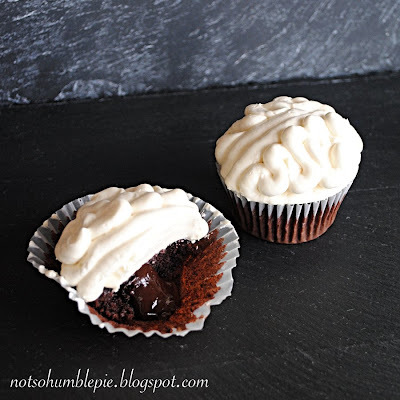 These cupcakes, topped with a swiss meringue butter cream and a chocolate ganache filling, pack all the health benefits of a stick of butter. Meaning, they're really good. Let's get down to how they're made. Place the chocolate in a heat proof bowl and set aside. Bring a sauce pan of water to a simmer and in a metal bowl combine the egg whites and sugar. Whisk the eggs and sugar in the bowl sitting over the pan of water (not in the water) for several minutes until the mixture is creamy and there is no grit if you rub the mixture between your fingers. Then transfer the eggs to your stand mixer with the whisk attachment and beat them to stiff but not dry peaks. Allow this mixture to cool completely (roughly 10 minutes). Then on medium speed begin slowly beating in all the butter a few tablespoons at a time and then add the vanilla. The mixture might look a little curdled at first, however continue beating until it comes together in a light fluffy mixture. Then remove the whisk attachment and use the paddle to mix the frosting on low speed for 2-3 minutes to beat any air bubbles out of the frosting. Using a piping bag equipped with a medium round tip (I used an Ateco #12) and filled with my frosting I pipped a half inch mound onto each cupcake. Then I began crafting my 'brain'. I started by piping a D-shaped outline on each side of the frosting mound and then filling the empty space with swirly brain-like frosting coils. That is it! 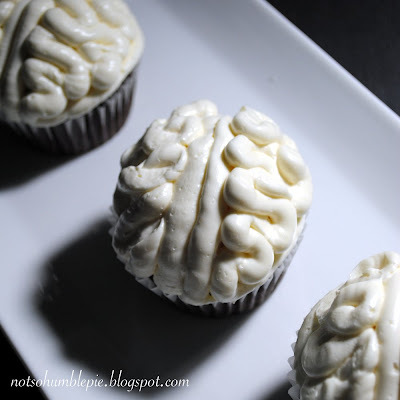 Brain cupcakes. These were soooo yummy. Swiss meringue butter cream has to be my favorite frosting (it will kill you, but it is just so yummy without being too sweet) and it compliments the bittersweet ganache very well. These are best kept at room temperature and eaten the same day. Wait... I totally missed my chance to fill a post with zombie jokes. With my IBS these would kill me but it looks like it would be a good way to go, lol! That is just too cool! Instead of "Pride and Prejudice and Zombies" it could be "Julia Child and the Living Dead." The hardest part of eating brains is opening the package. These just have those little paper skirts. Much easier! Ha, if I baked I would probably think of things like this to make, and hey I could get pass the brain looking icing and keep the main goal in mind...ha I said 'mind', no pun, but chocolate! awesome!!!! you make me want to bake!! Srsly, if you are not already talking to somebody about publishing a science-themed cookbook, you should start. Think Xmas gift-giving for science geeks 2010!! 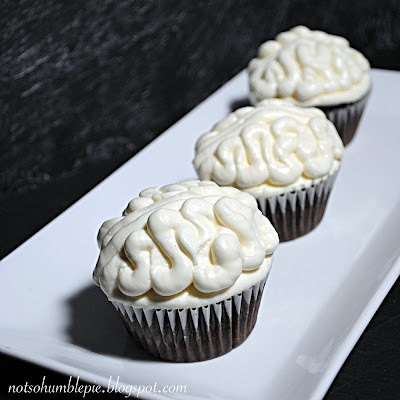 Who would have thought of brain cupcakes but it SO works! Very creative! These are AMAA-ZING! I am so enjoying your blog, Ms. Humble! I second S's comment. I would buy a science themed cookbook in a heartbeat!! I 'third' S's comment. I'd buy it if only to be as much a pseudo-geek as possible. Teacher: "Why do we have to learn science?" You: "So that when we grow up we can write uniquely interesting food blogs." PS - lol, I had been wondering about that...- "Because it is a well known fact that human brains are filled with chocolate ganache." Not only is your blog wonderfully smart and funny and delicious, but the colors you use for the backround is very soothing to my eyes. The layout of the blog is beautiful, and I love your pictures. You are one smart cookie! I agree with many of the other commenters that a science-themed cookbook would be awesome. I'd buy one for myself and a ton of other people! You make some very tasty looking sulci and gyri ms humble. I just love these brain shapes of Martha's. We did these shapes with plain old meringue at Halloween. Nice Brain cupcakes! I liked the design concept! Looks delicious. I am surely going to try them on new year eve fro my friends and family. These will make a wonderful treat! my dad and i made these as a we like to take on elaborate baking projects, and my mom insisted we didn't decorate them as brains (we were both pretty bummed), but they were AMAZING!!!! So decadent, and killer delicious. That icing is my ultimate fave now, and the ganache was soo rich. My mom said they were her favorite dessert ever and that she wants them for every birthday from here on out. Anyway, they were so scrumptious and not too hard really, so thanks for the recipe! Made these cupcakes the other day. They were a huge hit! Here is some blog love! My boyfriend and I made these cupcakes for his birthday party yesterday. 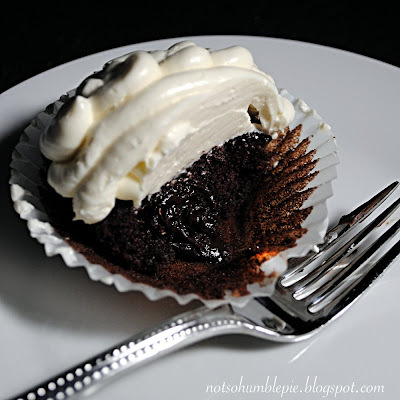 The frosting is well worth the effort to make it, although we had to switch from a hand whisk to a stand mixer (I'm not sure we would have made it if we didn't have one). One question: I omitted the corn syrup from the ganache, and it didn't set up well. I'm assuming it's necessary for this recipe?